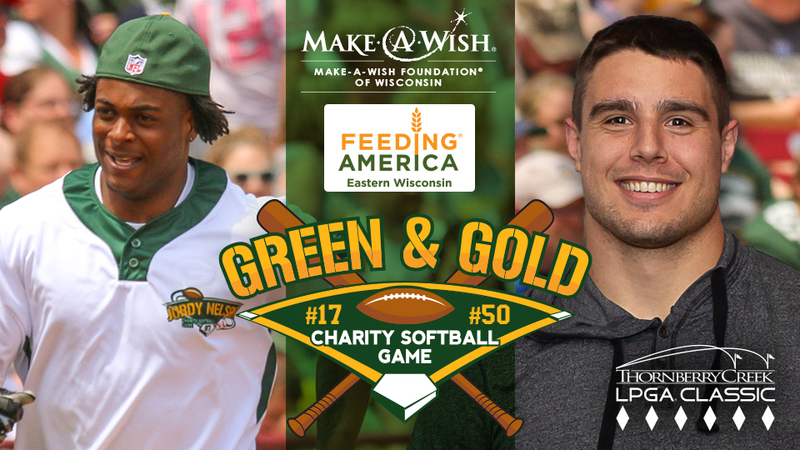 GRAND CHUTE, WI - Davante Adams and Blake Martinez have announced that Make-A-Wish Wisconsin, Feeding America Eastern Wisconsin, and a number of youth sports organizations will be the beneficiaries of the 2019 Green & Gold Charity Softball Game presented by Thornberry Creek LPGA Classic. The game will be held on Saturday, June 1 at Neuroscience Group Field at Fox Cities Stadium. Game time is scheduled for 12:05pm. Individual tickets for the game are on sale now through the Wisconsin Timber Rattlers ticket office and the team's website. "During my time in Green Bay, I've seen the positive impact Feeding America has in our community," said Adams. "I'm excited that this game can help give back to them and continue to help those in need"
Feeding America Eastern Wisconsin is the largest hunger-relief organization in the state, operating food banks in Milwaukee and Appleton. The food bank distributes more than 27 million pounds of healthy and nutritious food to pantries across 36 eastern Wisconsin counties. Driven by a mission to solve hunger, Feeding America Eastern Wisconsin works with member organizations to provide meals to 400,000 people in the local community each year. "I have seen firsthand what terminal illnesses can do to kids. Having an organization like Make-A-Wish there to bring a smile to a kids face is really special," said Martinez. "I'm glad that our game will help Make-A-Wish and let them help more kids out there"
Make-A-Wish creates life-changing wishes for children with critical illnesses. Since the Wisconsin chapter was founded in 1984, more than 6,700 Wisconsin families have experienced the power of a wish, resulting for many in a turning point in the fight against their illnesses. In 2018, the Wisconsin chapter granted 402 wishes, more than ever before in the state. Currently, more than 350 Wisconsin children are in the process of having their life-affirming wishes granted. According to a recent wish impact study, a Make-A-Wish experience leads to increased emotional and physical health for wish children. "We are thrilled to partner with the Green and Gold charity softball game and showcase the powerful partnership between Packers players, the Timber Rattlers and Lammi Sports Management who all work together to make wishes come true for wish kids living with critical illnesses," said Patti Gorsky, President & CEO of Make-A-Wish Wisconsin. The 2019 Green & Gold Charity Softball Game is presented by Thornberry Creek LPGA Classic. The Thornberry Creek LPGA Classic will be held in Oneida, Wisconsin July 2nd-7th, 2019. One of 33 LPGA tournaments held throughout the world, the Thornberry Creek LPGA Classic will attract 144 of the world's best golfers to compete at the Official Golf Course of the Green Bay Packers. Individual tickets for the Green & Gold Charity Softball Game include the sponsor game at 10:00am, the Home Run Derby at 11:00am, and the game at 12:05pm. The Timber Rattlers box office is open from 9:00am until 5:00pm Monday through Friday and from 10:00am until 3:00pm on Saturdays. Fans may call (920) 733-4152 or (800) WI-TIMBER or stop at the ticket windows to order tickets during regular business hours.